We're sorry, reservation times are not available online for a party of this size on the selected day. 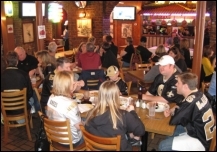 Please call us at 504-525-3661 and we will see if we can accommodate your party. For parties greater than 9, please contact us at 504-525-3661 for assistance with your reservation. Please be sure to include your Guest Type (required by Oceana Grill). Newsletter: By selecting any of the following options, you agree to receive communications from Oceana Grill. We do not share your information with any 3rd parties. You can withdraw your consent at any time. Stay personally connected to Oceana Grill with your free preferences profile. You'll have convenient access to Oceana Grill's news, promos and special events! And Oceana Grill can get to know you better with automated communication. Oceana Grill is located just steps off of Bourbon Street in the heart of the French Quarter. You will be mesmerized by the exquisite renovations of this historic building. The ambience and the cuisine are a dynamic duo. Our family owned and operated restaurant has the sights, sounds, and authentic New Orleans food coming directly from our kitchen that has delighted many people throughout our long history. Oceana is THE place to be, whether it's a dinner for two, a large party of 8 or more, or a banquet/catering event- we can do it all New Orleans style. With Chef Specials daily, Oceana Grill is sure to have exactly what you are looking for... a Great Atmosphere, and Great New Orleans Food!